The kijimunaa (or bungaya) is one of the most famous of Okinawa’s magical creatures. The kijimunaa is described as a sprite (Japanese yosei), that resembles a short young boy and with bright red hair, said to look like a troll doll. Some say that only children or the pure of heart can see the kijimunaa. They may or may not be seen accompanied by fire. They live in the tops of Okinawa’s gajumaru (ガジュマル, or banyan) trees; they are especially famous in the Yomitan area, where their images can be seen in many places. Kijimunaa are known for playing harmless pranks. Kijimunaa can also be helpful, but they are quick to change their minds. They enjoy fishing and eating fish. The only thing they fear is the octopus. Belief in kijimunaa is representative of the spiritual power of trees in the Ryukyu belief system. 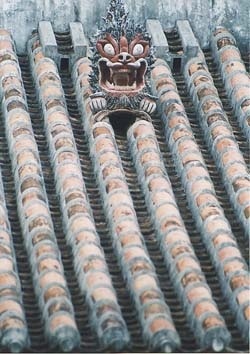 Another of the most famous Ryukyuan creatures is the shisa (“lion dog”). Shisa statuary is used for its ability to ward evil from a place. Its appearance and function is believed to be Chinese in origin. The Ryujin sea dragon king is particularly associated with Ryukyuan legend and mythology. In the Irosetsuden, dragons display powers like those of gods, and live in their own undersea kingdom. The traditional Ryukyuan conception of dragon is largely similar to that of Indian and Cambodian naga myths and of Chinese dragons…myths concerning an undersea kingdom of powerful reptilian beings are common to the Indian and Southeast Asia as well as Central and East Asian cultures. Nirai Kanai is the mythical place from which all life originates. “Nirai Kanai” is referred to in the Irosetsuden as the underwater realm of the Dragon or Sea King. It is worshipped facing westward, and according to fable is an island. Gods from Nirai Kanai are said to have brought different crops and tools to the Ryukyuan people at different times. In the Hachijojima islands today the Mayanokami divinities, faces hidden by masks or hats of leaves, make their regular appearances in boats … hailing from the land of Nirai, like Tokoyo, across the seas. They perform songs and dances, and issue prophecies, admonisions, warnings and blessings. On other islands they are known as Agama. “Two types of creation myth can be found in the Ryūkyūs, the court myth contained in works compiled by the Shuri court, and folk myths circulating in Amami, Okinawa, Miyako and Yaeyama. The mythology is made very complex by the numerous similarities and differences between them and the variety of motifs. The work Chūzan seikan(1650) represents the best example of court mythology. According to it there was a deity called Amamiku living in the heavenly palace who was ordered by the Heavenly Emperor to descend to the earth and create islands. Receiving earth, rocks, grasses and trees from the Heavenly Emperor, Amamiku created a number of islands. Amamiku requested human stock (hitodane) to populate the islands. In response, the Heavenly Emperor sent down two divine children, a boy and a girl. These two beings became pregnant by the passing wind, and three human boys and two girls were born to them. The eldest son became the progenitor of the royal house, the next son that of the aji (local chieftains), the third son that of the farmers, the eldest daughter that of the kimigimi (high-ranking court priestesses) and the youngest daughter that of the noro. Amamiku ascended to heaven and begged for the seeds of the five grains; having received them the deity planted them on Kudaka Island, and in Chinen and Tamagusuku. This myth tells of the world of the deities and the creator deity, of the creation of the land and the people, and of the origins of grain (the staple food). The heavenly nature of the deities’ realm recalls obotsu-kagura, the Other Realm. Many traditions consider Amamiku to be a female deity and the wife of the male deity Shinerikyo. The composition of the group of the five children exemplifies the ideology of the royal court unifying worship and rule. The agricultural rituals performed at court were based on the mythology regarding the origins of the five grains…any of the folk myths speak of creation by siblings rather than by a deity descending from heaven. …Many also tell that the first child was deformed. According to the Ryūkyūkoku yuraiki Amamiku brought rice seeds from nirai-kanai, and this version is numerous in folk traditions. Myths also exist that a bird brought seed from the other world and dropped them in this world, and that a giant called Amanchu divided heaven and earth. Irōsetsuden (遺老説伝), translated by Sally Ooshiro. Presented as thesis towards completion of M.A., University of Hawaii, 1964. Along with the Omoro Sōshi, it is one of the most important collections of Ryukyu history and legend. Compiled in the 17th century by Shuri scholars. Thank you so much for this blog! Each and every title is so interesting, and it’s a wonderful treasure to find so many varied traditions and snippets of Japanese mythology in one place.